Visit Gibbs Sculpture Farm with an experienced guide and art historian. Tour leaves Selwyn College 9am and returns 3pm. Regretfully we cannot accept alternative travel arrangements. Reasonable mobility and fitness necessary for this walking tour. Take this rare opportunity to visit this amazing sculpture park, with works by key artists including Andy Goldsworthy, Chris Booth, Len Lye and Richard Serra. There are few better opportunities to engage directly with works of this size and calibre in the Southern Hemisphere. Tour dates will be added as tickets become available from the sculpture park. If no dates are published, please register your interest with the office and we will notify you of any new dates that become available. 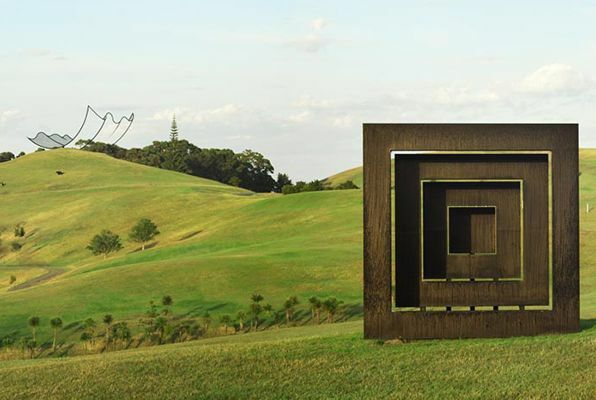 This day trip by minibus to the famous Gibbs Farm sculpture park on the shores of the Kaipara Harbour, will be hosted by one of our art guides. During the bus trip, your guide will introduce you to the exhibits and artists so that you are primed to get the most of your sculpture farm experience. You will spend approximately four hours at the farm where you are able to choose whether to wander around the sculptures at your own pace (assisted by a map and explanation of the exhibits) or follow the guide to view and hear about the sculptures. The terrain at the sculpture park includes gravel paths, lots of hills and open pasture so a reasonable level of mobility and basic fitness is required. The distance covered is approximately seven kilometres but due to the rugged terrain it can be hard work so it is essential to bring snacks to keep your energy up. If you have mobility challenges, please contact the office to discuss your situation. Participants should wear walking shoes or boots (according to the weather). It takes 3-4 hours to cover the whole sculpture farm. The guide will move across the farm at a reasonable pace to visit as many exhibits as possible. Participants can follow the guide or make their own way around the farm (or a combination). The tour will proceed regardless of weather, so dress appropriately for the day (eg raincoats, sunscreen, hats). There are no refreshments available to buy at the farm so bring a sandwich, snacks and a drink with you (see note below) The tour bus leaves from Selwyn College, Kohimarama, at 9am and returns to the school by 3pm (traffic dependent). Due to a limited number of seats on the bus and entry tickets to the park, it is essential to enrol for this tour prior to attending. We regret that we cannot accept alternate travel arrangements for this tour. All participants must depart from and return to Selwyn College. If you do not wish to join our bus tour, you may wish to make your own arrangements to visit the sculpture farm. Please visit their website here. When travelling to Gibbs on this tour you have the option to pre-purchase a lunch from the charity ‘Eat My Lunch’. For each lunch you buy, they will give a lunch to a kiwi kid who would otherwise go without. Instructions will be sent when you enrol for the course. "Hi Anne, Just to advise that Lawrence and I really enjoyed our trip to Gibb's farm last Thursday. Rowan was great as a guide and host! And it was great being driven - saved us from the Auckland traffic. Many thanks again, Regards, Gail & Lawrence"
"Hi, I really enjoyed the trip, it was a fantastic experience and very well organised. We didn’t realise that they would be guides as well. What a bonus! The two guides were excellent, especially Linda. I would really like to go to the sculpture farm again , so please let me know when there is another trip planned! Many thanks, June"
"Had a great day. Enjoyed the bus trip especially returning a different route. Loved the sculptures. Lots of thanks to Linda for the commentary and insights and enthusiasm and energy. Simply superb. We will go again. Thanks Terry"
"Hi, So glad we finally got to see this amazing place and on such a great day weather wise. Great commentary on way there, as we toured round and on the way back. In summary 10/10. The only comment i would make is it would have been great to see a few of the things we didn't quite have time to see and my suggestion would be that the bus may be left at least 15 minutes earlier just to maximise the time at the farm. Thanks again. Definitely keen to do it again. Thanks Nigel"
"Excellent well organised function; the information provided both in print and vocally was terrific. Murray"
"Hello I would like to express how much we enjoyed the day at Gibbs Farm. Having such great tour guides was excellent. I learnt a lot and having them share their knowledge was wonderful. Would thoroughly recommend to everyone. Thanks Sonia"
"Greetings - Just wanted to say a big thank you from our group for a fabulous day at Gibbs Farm. It was a really great Christmas outing. We really enjoyed Glen' s relaxed and informative style. A perfect guide. Have a great Christmas break Best wishes Margaret M"